If you love floral fragrances, then Coach Poppy Flower Eau de Parfum is most certainly the one for you. Notes of wet ivy, citrus, lychee, cassis, jasmine petals, water lily, rose, musky peony, sugared raspberry, amberwood, musk, apricot skin and soft sandalwood make for a youthful, vibrant and totally lighthearted fragrance. And just how gorgeous is the bottle? Today, one lucky winner has the chance to win a bottle of Coach Poppy Flower Eau de Parfum, with a retail value of $85! Here's how to enter! 2) Get an extra entry for liking The Beauty of Life on Facebook and leaving a comment on the wall telling me why you want to win this fragrance. 3) Get an extra entry for following me on Twitter and send me a tweet telling me why you want to win this fragrance. Be sure you are following me and include me in your tweet or your entry will be disqualified. This giveaway ends on Monday, August 29 at midnight. One winner will be chosen AT RANDOM on Tuesday, August 30. Maximum of THREE ENTRIES (one for each way listed above). Multiple entries will be disqualified. Giveaway is open to US residents only. Love the decription of the scent of this Coach fragrance. Floral notes are my fave. thx for the giveaway. Hi, I'd love love LOVE to win this because it smells AMAZING! GOTTA try this, oh man! I like on FB & wrote on your wall- Jeni D.
I recently received a Sephora Sampler with 10 fragrances ..... One being this one- by Coach!!!!! The sampler comes with a certificate to redeem for a full size bottle of your choice- Coach was going to be my pick!!!!! But wait .... I would love to win this one! patgon4@aol.com Good Luck to ME!!!! Wow, great giveaway and thank you for the chance! I did not know that Coach made perfume. This would be a great win to have in time for the Holidays. I love all things Coach...I would love to have this perfume...Thank you for this chance. I would love to try this fragrance. I have been wanting to try this perfume, love the comination of scents! Thanks. It would be wonderful to win this awesome perfume! I just finished the last drop of my Viva La Juicy and this girl really needs some new perfume! Coach purses are the best...their perfume has to be just as great. I love anything with jasmine too! and I left you a message on your FB wall, too! This perfume just looks like it smells divine! I like your FB page, I left a comment there (Lailaa Ragins) and I tweeted you (Yasmeen226). I LOVE floral fragrances! The closest I have right now is rosehip oil, for my face. No fancy perfumes on my dresser. Yet. I would be blessed to win this. Gorgeous Bottle! Would love to win! Amazing! Such a beautiful bottle. EXTRA ENTRY: I left a comment on your wall under: Nicole O. <3 I'd love to give this a try~! Thank you! i smelled this in august's cosmo. i am IN LOVE WITH IT. i want to win! The description makes this fragrance sound light and wonderful, something I would like to try. I've used one parfum most of my life and it has gone out of business years ago. As such, I have saved up my stash and only use it on special occasions. I would love to find another that I love as much as can wear whenever I wanted but I don't have the money to spend exorbitant amounts of money trying new scents. These giveaways give us the opportunity to possibly these new scents and give them a chance to see if they suit our body chemistry. Thank you for this generous opportunity. I bet this smells wonderful and would love to try it. I wanna win this perfume! I would love, love, love to try a Coach fragrance! I want to try this perfume so bad! What a lovely bottle with a lovely scent awaiting! A woman can never have too many perfumes. soo nice! i hope i'm still eligible to win since I won earlier in the week! i am already a fan on facebook,and left a comment on your wall. thanks for this chance,hope to win. It has 2 of my most favorite scents..rose and sandalwood...would love to win this! This would be a wonderful opportunity to try a new product. Thanks for the chance. I have always wanted to cry one of Coach's perfumes, this sounds amazing! I have never tried this perfume before, but it sound like it has most of my favorite scents in it - all that's missing is some patchouli! I'd LOVE to win this! Thanks for the chance! From the description it sounds like it smells beautiful- I'd love to try it! I already like your Facebook page (Dara Nix)!- and I'd love to win this because it has MOST of my favorite scents in it! omgosh! I actually just tried this at Sephora the other day. My boyfriend actually likes it. He is the hardest person to impress with perfumes! My daughter would love this perfume. We have a lot of Coach fans in this house, I'd love to try the scent! I would love to win this for my daughter-in-law. Her birthday is next month. I love the Poppy collection from Coach, I got a sample from Nordstrom and it would be sweet to win! This perfume sounds wonderful, I would love to try it! The combination of notes in this Parfum sound wonderful. And I would love to try it. I do love a nice scent. Thanks for the chance to win! This perfume would be a great prize to win. Not only does the fragrance sound good but the bottle is beautiful!! love to win Coach Poppy Flower Eau de Parfum because I like trying new fragrances! 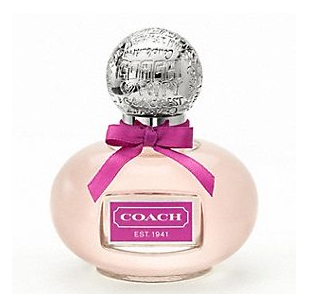 I've been loving other perfumes mentioned in this blog and would love to give Coach a try!!!! I would love to win the new Coach Poppy fragrance because I love trying new floral scents! I follow on FB & wrote on your wall. I haven't tried this perfume yet, but I love trying new fragrances. This one by Coach sounds exquisite! I love love love this fragrance! I'd love to win this fragrance! I love this! Thank you for the opportunity to win. i've never worn a fragrance before, but this one sounds delightful. i would love to try this:) and you're right, that bottle is stunning! Left a comment on the wall as Lynn Brooks. I think perfume is truly one of life's necessities! Thanks for the opportunity. I currently use Daisy by Marc Jacobs but have been itching to try out this perfume by Coach since I've read rave reviews! Ooh, looks like it smells purty! Ohh...I love this! How pretty. jmarisol on gmail. I've never tried any of the Coach perfumes, but this perfume looks amazing!! Thank you so much for doing the giveaway! I want to win this fragrance because it sounds delicious for summer. I smelled the sample in Elle mag and promptly rubbed it all over my arms. Couldn't get enough! You picked a great gift for a giveaway! This sounds like a great fragrance! I am unemployed, on a tight budget and running low on perfume. This would make my day if I were to win this. I'd win 'em over at job interviews!! Thanks for the giveaway...would love this for my wife who is a "Coach-oholic". This would make a nice gift for my wife! Wow I love the scent of flowers. Please count me in! Only a few days left of your giveaways. I would really really love to win this perfume. I love anything coach. I'd love to win. E-mail is in my profile.